Congratulations to Karleen Pipitolu in Auckland, New Zealand! 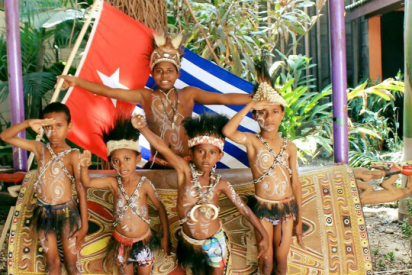 Every year on 1st December, the people of West Papua celebrate their National Day, marking the anniversary of the time the West Papuan flag was first raised on 1st December 1961, with the promise of full independence exactly 9 years later. This is accompanied in solidarity with a Global Flag Raising, when the West Papuan flag is raised all around the world to show support for the West Papuan people and their struggle for freedom. It is illegal for West Papuan people to raise their own national flag under Indonesian law and they can be imprisoned for 15 years just for doing so. We decided to encourage people to take dramatic photos of themselves raising the West Papuan flag, and thereby raising more awareness and interest in the West Papuan struggle. While every flag raising is just as valued and important, we agreed to send a special Free West Papua gift to the individual/group who we feel has taken the best/most dramatic photo. After discussing with Benny Wenda and the Free West Papua Campaign Team, it was decided that Karleen’s flag raising was to win the award for the most dramatic. Not only did she raise the West Papuan flag in the striking and prominent location of Mt. 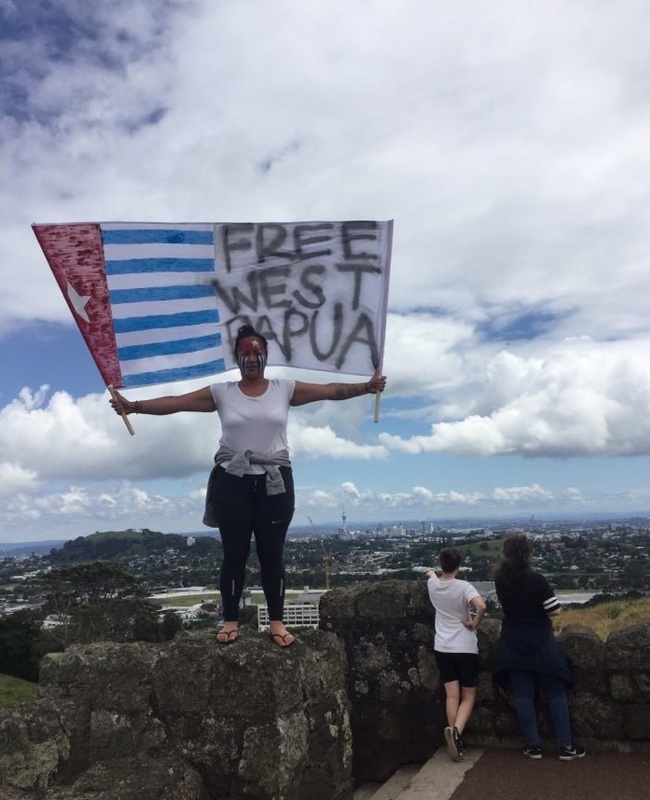 Eden overlooking the entire city of Auckland but she also raised the West Papuan flag (painted by herself along with the words FREE WEST PAPUA) across the city, including on a bridge at Auckland Southern Motorway and at Tree Hill. 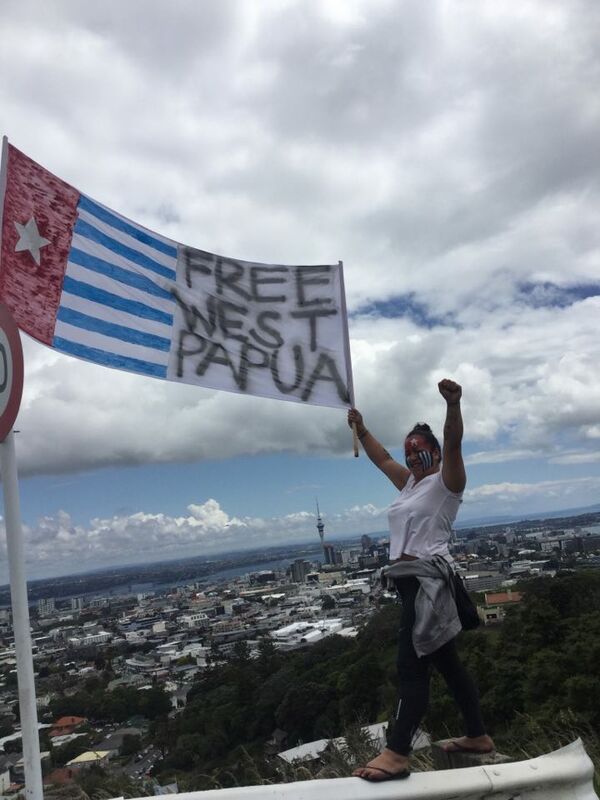 Painting her face with the West Papuan flag and standing in solidarity with the freedom struggle, Karleen’s commitment for the day did much to help raise awareness and inspiration for people across city and around the world online. “I first heard about the current situation In West Papua from a video being shared via Facebook from my brother a few years ago. Before I watched this video I knew nothing about West Papua or its struggle of freedom from Indonesia. I started to do some research on West Papua and was saddened by what I saw and read. In the moment of reading what I did – I felt so helpless and upset that I had no power in helping the people of West Papua. We would like to thank and congratulate Karleen as well everyone around the world who raised the West Papuan flag on 1st December. 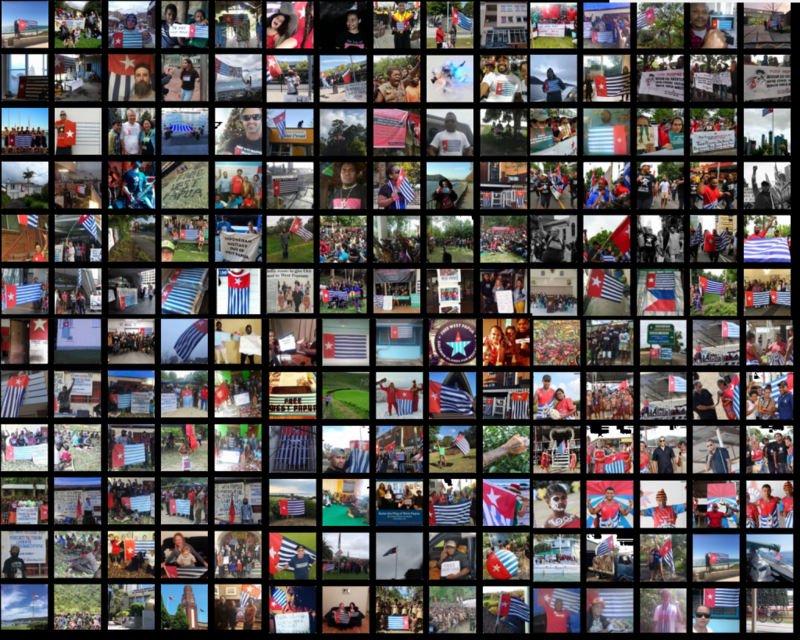 Last year there was a truly incredible response to the #GlobalFlagRaising call and we received over 250 photos from over 30 countries making it the biggest Global Day of Action for West Papua in history! 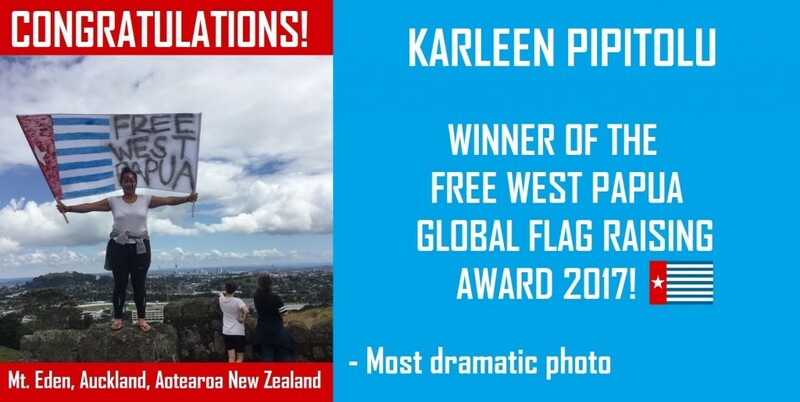 Though we feel Karleen’s photo was particularly dramatic, all of the photos taken and flag raisings made were of real importance and meant so much to the people of West Papua who do not have the freedom to raise their own national flag in their own country. “You give strength to my people and give hope to our freedom struggle. Knowing that we have not been forgotten but are supported by people across the globe means everything to us and we are deeply inspired and moved by your true expressions of humanity and compassion. You are the voices of the West Papuan people in your countries and your actions will be recorded in our history. Wa wa wa”. The growing international support and solidarity of people around the world for West Papua truly is inspirational and we continue to be further inspired daily, every time we see a new person raise the West Papuan flag or tell others about the situation. We encourage everyone to keep up the great work! Find out more about what YOU can do to Take Action for West Papua below. With your help, West Papua is slowly but surely walking down the long road to freedom. You can help a lot by donating and supporting the Free West Papua Campaign’s efforts. We operate with limited resources and face big challenges when it comes to fundraising. Most charitable funds will not support political campaigns and international awareness of the situation in West Papua is very limited as all NGOs and foreign journalists are banned from the country. So, despite the severity of this brutal occupation, we are forced to operate on a shoe-string.